The slow periods for many guides, known to some as "shoulder" seasons, are generally the late fall and early spring. For me, these times of year are good for being at home, cooking, cleaning, maintaining a healthy relationship with my lady friend, and training. Once the guiding season gets rolling it's harder to find good blocks of time to train. Summer days are hot and I don't feel like climbing or running after working all day in the sun. Winter days are short and it's hard to run outside before dawn or after work in the darkness. I almost always spend an evening or two each week in the climbing gym, but gaining real climbing strength and endurance plus a substantial aerobic base takes hours of time. Four hours of aerobic exercise plus 10-20 hours of climbing each week seems like more free time than many of us have available. I try to make big fitness gains during the spring and fall, and maintain fitness throughout the year. Sometimes I'm successful and other times I feel sloth-like by the end of a long guiding season. Near the end of this past ice season, during early March, I attempted to flash (nearly onsighting) Hydropower in the Black Chasm. 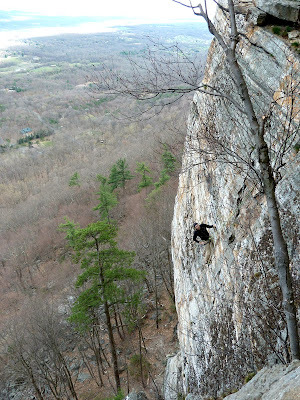 It has sustained challenging mixed climbing that lasts for nearly 80 feet. Fun climbing gradually increases in difficulty until you're force to make repeatedly long M7-ish moves for the final 30 feet. When Matt McCormick established the line he called it M9-. During my initial attempt this spring I hung on for so long trying to figure out moves that I was spent for the rest of the day. I let go only four feet from the ice but I knew there was no way could move up or even clip the next quickdraw overhead. This effort was so physically demanding that I experienced severe delayed onset muscle soreness (DOMS) that lasted five days after the effort. My biceps and calves were so tired during the following days that any sort of climbing or running was out of the question. The following week I began running again and felt so beaten down that getting out of bed in the morning was painful. My calves were dreadfully sore and I was experiencing severe muscle tightness in the upper portion of my left hamstring. The experiences served as a reminder for me that, while my job is quite active and physically demanding compared to many indoor jobs, I can't expect to have a high level of fitness without extensive training. Our warm winter hadn't provided enough days outside climbing and I hadn't been running or hitting the climbing gym enough to train. Long routes and hard pitches don't come easily if you haven't been training. Carrying a heavy pack uphill all day or trying to move fast through moderate alpine and rock terrain only leads to muscle cramping and fatigue if you're not fit. I'm four weeks into a serious training cycle now. The muscle soreness has abated and I have plenty of energy after most days of climbing and running. Some of my days off have even become almost entirely devoted to fitness, with a morning run, plus an evening run and a rock gym session at some point during the day. Get a heart rate monitor. 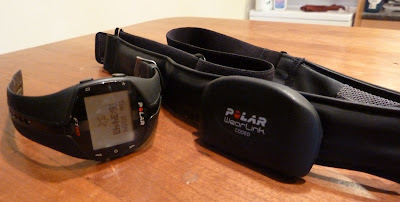 In January I began using a new heart rate monitor, a Polar FT80, that allows me to track individual workouts and look at the data from each week of the year. It's been useful for building an aerobic base and ensuring I don't work too hard unless I want to. Find good training partners. 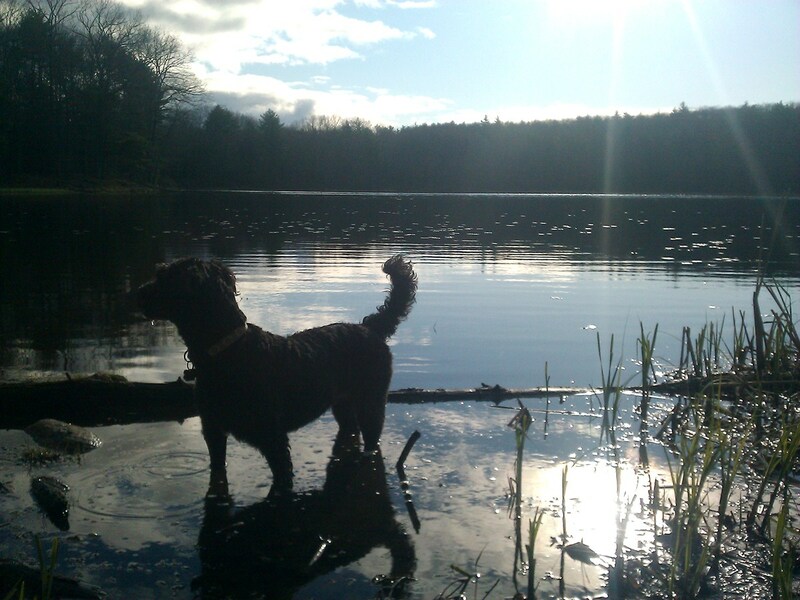 For running, I'm a big fan of having my dog along. She's fitter than I am for running, always psyched to go out, and loves to trail run. I've also joined a local running club and occasionally do X-C races or track workouts with a group. On the rock, I've tried to find people that are willing to go along with me on longer days and are willing to push the grades a little. It's still early season, but getting a few really challenging days in early pays off later in the season. Have several pairs of running shoes. We all have multiple pairs of climbing footwear – boots for ice, maybe double boots for really cold weather, approach shoes for easy climbing and edging shoes for hard rock routes. Why not have several pairs of training shoes? I keep a supportive trail runner on hand for off-road running and a lighter, road-oriented cushioned/stability shoe around for road runs and speedier workouts. I also use custom sports orthotics in my training shoes. This seems to help prevent injury in the lower body. Sleep as much as you can. Starting this past fall my partner and I began going to be earlier. Getting up in the morning isn't dreadful and you'll have more energy late in the day. Try to get an aerobic workout first thing in the morning. It seems to help the day along and then you don't have to worry about not working out in the evening, or you can go boulder or hit the gym at night. Eat well and you can eat as much as you want when you're working out a lot. For me, as long as I don't eat crap I can eat whenever and whatever I want when I'm training and I still seem to get leaner. Minimize alcohol consumption and don't drink too late at night either. You'll stay leaner and sleep better. Try to enjoy workouts and each day but still keep your goals in the back of your mind. I love being outside and that's one of the most important factors for me. However, while training I do try and focus on my goals, it seems to keep me motivated. Remember, it's supposed to be fun. However, it isn't always easy to roll out the door at dawn for a run before work or at dusk when you're tired from the day. Knowing that your training makes achieving your goals easier is good motivation though.